View the LOOK INSIDE feature and order on Amazon- Click here! Are you worrying more and wondering, what’s going on in this crazy world of ours? Are you freaked out by how fast time is flying by? Are you experiencing an increasing sense of urgency to “wake-up!” as if your existence to this point has been some sort of dream? Whether you have answers to these questions, or not, this workbook has something for you. Mind-expanding meditations, affirmations, physical and journal writing activities merge the psychologies of East and West in a novel and exhilarating way. Starting with Freudian psychoanalysis and chakra one, explore a seminal and stunningly parallel develop-ment of psychological theory over the past 100 years, bringing us to today with Celestial Psychology® and chakra seven. 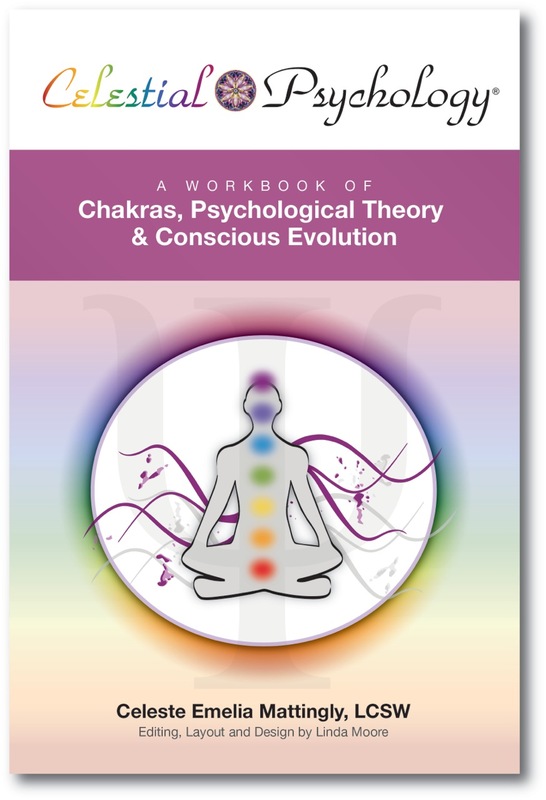 The exercises and concepts in this workbook inspire profound and lasting change for the individual, ensuring optimal mental health for generations to come, and contribute to the much needed Great Shift for the collective. The concept of Conscious Evolution is skillfully articulated throughout these pages to awaken a triad of evolutionary perspective, worldview, and trajectory. This triad creates a spiral of optimistic thought that is imperative for the survival of the individual, mankind, and Gaia, our Mother Earth. This workbook fills a need at this critical time in history when survival depends on Homo sapiens be-coming enlightened Homo-luminous beings who are cooperative within themselves (balanced ego and essence) and with each other, globally and universally, thereby creating a new era for humanity. The in-corporation of energy medicine and an evolutionary trajectory into psychological theory is the differenti-ating and novel approach of Celestial Psychology®, leading the call for the fifth great wave of psychology– Conscious Evolutionary Psychology. Celeste invites you to take this journey with her—whether you are a layperson looking for an-swers or a helping professional or a novice to spiritual empowerment or most adept—this work-book has something for you. Revolutionize your approach to healing yourself, others, and the planet! Blend holistic techniques and standard psychotherapy to transform mind, body, and spirit. Activate your innate energy force fields with empowering exercises designed to enlighten and elevate consciousness. Discover your place in today’s complex world. Celeste Emelia Mattingly, LCSW is a psychotherapist in private practice in West Hartford, CT. She has over 28 years experience working in a variety of recovery settings serving adults with mental health and addiction issues. Her heal-ing and teaching methods have helped hundreds of clients and participants master emotions, overcome addictions and negative behavior, as well as improve coping, communication, stress and anger management skills. She is re-nowned for encouraging everyone to access their own strengths, and innate healing and psychic abilities and to raise consciousness, naturally, in order to promote profound and permanent change. This entry was posted in Birth 2012, Celestial Psychology, Evolutionaries, The Center for Holistic Empowerment, The Shift. Bookmark the permalink.